I’ve never reviewed a book I didn’t finish, but I figured I should start doing it because it’s still useful information for readers. 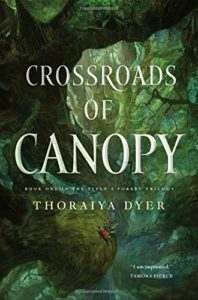 So here’s the first one – Crossroads of Canopy by Thoraiya Dyer. Crossroads of Canopy is set in Canopy, a treetop city divided into thirteen niches, each the home of a god. Souls enter the body of its inhabitants at birth, and anyone could end up being the reincarnation of a god. In order to escape her parents plan to sell her into slavery, Unar, a young girl from a destitute family, volunteers to serve at the Garden of Audblayin, the goddess of growth and fertility. She has high hopes for her future, but as they are repeatedly dashed, she is forced to venture outside Canopy to seek glory. I really thought I would like this book – it has a unique fantasy world and a female protagonist coming of age, and it took me a while (and reading another review) to figure out why I didn’t. Unar is unlikeable – she’s selfish, ambitious, and impetuous, but she’s played straight as the hero. Her constant sexual fantasizing about someone who is literally incapable of returning her desires skeeved me out too. I didn’t care about any of the other characters either, and so I didn’t care what happened to them. I stopped reading about halfway through, and there was still no larger plot established, it just seemed like The Adventures of Unar Seeking Fame. Maybe Unar gets better in the second half of the book, and maybe she learns more about herself and becomes a better person – I’m not sure. I did skip ahead and read a little bit of the end, and it seemed like she did learn something. I was already disinvested and frustrated by that point, though. I feel bad writing this review – Crossroads of Canopy is definitely not badly written or executed. I’ve disliked a few other recent books that many other people have loved (A Darker Shade of Magic by V.E. Schwab, Updraft and Cloudbound by Fran Wilde), and this book reminded me of those, although I’m still struggling to articulate what they all have in common. If you liked one of those books, maybe you’ll like this one more than me. This entry was posted in Books, Reviews and tagged abandoned, book 1, fantasy, fiction by Kriti Godey. Bookmark the permalink.